Scheduled transfers by air-conditioned vehicle from the Airport / Margaon / Karmali Station. 3 nos each of Breakfast & Dinner on buffet or fixed menu basis on MAP Plan. Half day tour to Old Goa and Mangueshi Temple by air conditioned vehicle on seat sharing basis and as per schedule offered by the hotel. Tour to Calangute Beach by air conditioned vehicle on seat sharing basis and as per schedule offered by the hotel. One bottle of mineral water ( 1000 ml) complimentary in the room on arrival. Happy hours discount on Salud Bar. Scheduled shuttle service to Panjim / Dona Paula Circle, subject to prior reservation. In case of No show –100% retention will be applicable. In case of any cancellation made one month prior to check in date – no retention would apply. In case of any cancellation within one month of check in date – 100% retention will be applicable. In case of No show – 100% retention will be applicable. Check in before 8 am will attract a full charge of previous night. Check in between 8 am to 11 am will attract a charge of Rs. 1500/- on room only basis subject to availability. Check in between 11 am to 2 pm will be without charge subject to availability. Check out between 1 pm to 6 pm will attract a charge of Rs. 1500/- on room only basis subject to availability. Check out after 6 pm will attract a full day charge subject to availability. Extra adult / child rates are inclusive of extra mattress. A charge of Rs. 500/- per night would apply for a rollaway bed. Indian nationals to present an ID proof (driving license, pan card, voter ID & foreign nationals have to present their passport and visa details at check in. Above rates are per night rates on Bed & Breakfast basis. Occupancy as specified above. Compulsory meal supplement – As per hotel policy. Includes Entertainment and Gala Buffet Dinner. (Drinks not included). Minimum length of stay Minimum stay of 3 nights/ 4 days required over period 20th December ’16 to 2nd January 17. Rest of the year min stay is of one night. Indian nationals have to present an valid ID proof (driving license, pan card, voter ID) & foreign nationals have to present their passport and visa details at check in. 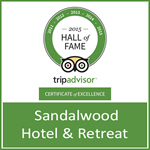 Copyright © 2016 Sandalwood Hotel & Retreat.